…wheat, the historic amber-waved grain of the American bread-basket, is out of fashion — a beleaguered has-been crop on many farms, supplanted by the modern cash-cow of farming: corn, used for everything from ethanol fuel to food additives to animal feed. Fewer acres of wheat were planted nationally last year than any year since 1971, according to federal figures. Kansas, the biggest wheat-producing state, had fewer acres in cultivation this year than any since 1957. I’ve talked about the troubles of wheat before. In short: it’s very difficult to produce hybrid wheat which keeps yield down, and farmers and companies worried about consumer fears of genetic engineering have kept genetically engineered wheat from being developed. Neither of those is a knock against wheat as a crop or a species, but the end result is there are more and more parts of the country where farmers can make more money planting corn than they could if they grew wheat. I have some problems with the idea the nytimes seems to be pushing that corn has recently displaced wheat as the crop of choice for American farmers. America has been a nation of corn for a long time. These days corn has more of a PR problem than it used to, but it’s not some crop that came out of nowhere to. The factors I mentioned have tipped the scales slightly further against wheat, but wheat hasn’t been displaced as the first crop of America, simply because it never was to begin with. 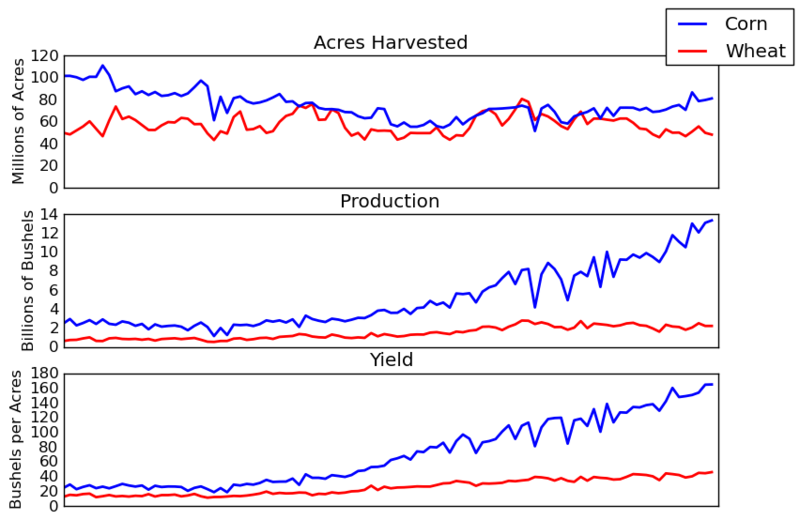 Notice that total production of wheat has not dropped along with the total amount of farmland devoted to producing wheat. Instead, increasing yield per acre has allowed farmers to continue to produce the same amount of wheat while planting less total land.